Random House Books for Young Readers, 9780375870897, 304pp. Charlie and the Chocolate Factory meets A Night in the Museum in this action-packed New York Times Bestseller from Chris Grabenstein, coauthor of I Funny, Treasure Hunters and other bestselling series with James Patterson! Kyle Keeley is the class clown and a huge fan of all games—board games, word games, and particularly video games. His hero, Luigi Lemoncello, the most notorious and creative gamemaker in the world, just so happens to be the genius behind the construction of the new town library. Lucky Kyle wins a coveted spot as one of twelve kids invited for an overnight sleepover in the library, hosted by Mr. Lemoncello and riddled with lots and lots of games. But when morning comes, the doors stay locked. Kyle and the other kids must solve every clue and figure out every secret puzzle to find the hidden escape route! Don't miss the next puzzle-packed adventures—Mr. Lemoncello's Library Olympics and Mr. Lemoncello's Great LIbrary Race! 44 STATE AWARD LISTS AND COUNTING -- INCLUDING THE SUNSHINE STATE AWARD! *"Full of puzzles to think about, puns to groan at . . . this solid, tightly plotted read is a winner for readers and game-players alike." Chris Grabenstein is the author of the New York Times bestselling Escape from Mr. Lemoncello’s Library, Mr. Lemoncello’s Library Olympics, The Island of Dr. Libris, and the Welcome to Wonderland series. He is also the coauthor of several bestselling series with James Patterson, including I Funny, Treasure Hunters, House of Robots, and Jackie Ha Ha. Chris lives in New York City with his wife, JJ, two cats, and a dog named Fred. Visit him online at chrisgrabenstein.com, and follow him on Facebook or on Twitter at @cgrabenstein. 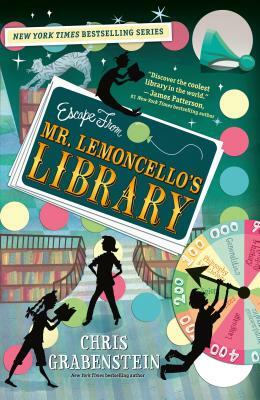 Don’t miss the third Lemoncello adventure, Mr. Lemoncello’s Great Library Race, coming in October 2017! "Full of puzzles to think about, puns to groan at and references to children’s book titles, this solid, tightly plotted read is a winner for readers and game-players alike."